The sparkle and glitter of Swarovski is a perfect compliment for the magic and beauty of the holiday season. Make your festive statement with beautiful Swarovski crystal charms, pendants and earrings that are fun and so simple to make! With the holidays just around the corner, it’s time to start working on some festive designs using beautiful Swarovski Crystal components stacked on a eyepin or headpin. It couldn’t be simpler! These very simple projects are fun, sparkly, easy to do and add unique flair to your holiday wardrobe! A perennial favorite for the holiday season is the Swarovski Margarita Christmas tree. Swarovski Gifts are always fun and make a very cute pair of earrings. Christmas angels give you so many options in one design! Use cones or flowers for the shirt, pewter or Czech angel wings and any round bead for the head! 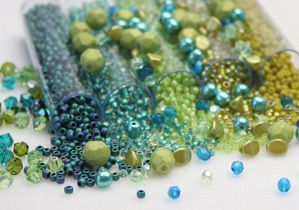 Mix and match your colors, add embellishments like a spacer for a halo. The possibilities are endless and every project is unique.